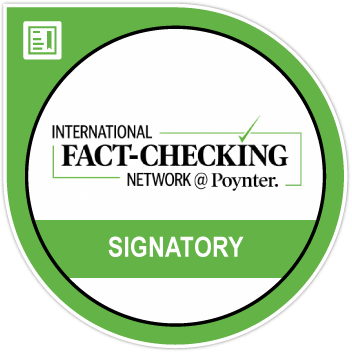 Did Manmohan Singh say the governments of Madhya Pradesh and Chhattisgarh were very good? Amit Malviya, head of the Bharatiya Janata Party’s (BJP) information and technology operations, tweeted a cropped video on Tuesday of former Prime Minister Manmohan Singh purporting to say the BJP-ruled state ‘governments of Madhya Pradesh and Chhattisgarh were very good’. However, a longer clip revealed that the Singh said his relationship with those state governments were very good. 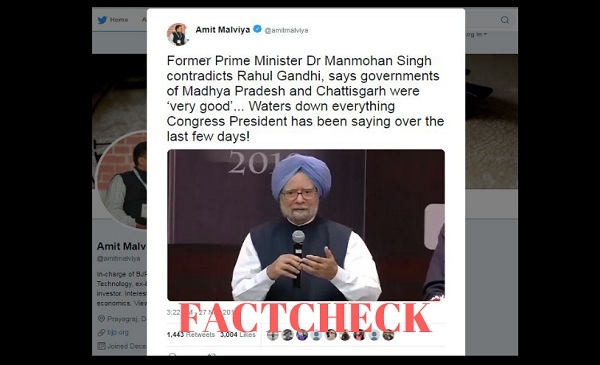 Malviya tweeted the seven second clip claiming Manmohan Singh’s comment contradicted and watered down everything Congress President Rahul Gandhi had said over the last few days about the two states. Ironically, the sentence has been clipped from an answer by Manmohan Singh on the current political discourse where he advised Prime Minister Narendra Modi to exercise restraint while campaigning. Singh was speaking on Monday at the launch of Congress leader and former union minister Manish Tewari’s book ‘Fables of Fractured Times’. Singh’s remarks were widely reported by the media as well. “The governments of Madhya Pradesh, the governments of Chhattisgarh were very good,” Singh appears to say in the viral clip tweeted by Malviya. However, a longer version of the video shows that the sentence was clipped to drop the preceding words “My relation with”, where Singh spoke about his equation with the states ruled by the BJP. A longer version of Singh’s reply was tweeted the Indian National Congress’ official handle. Interestingly, the cropped video was also tweeted by journalist Rajdeep Sardesai. However, Sardesai’s video is a longer clip. He also provided context to Singh’s remarks. The video was earlier debunked by True News Bengal.